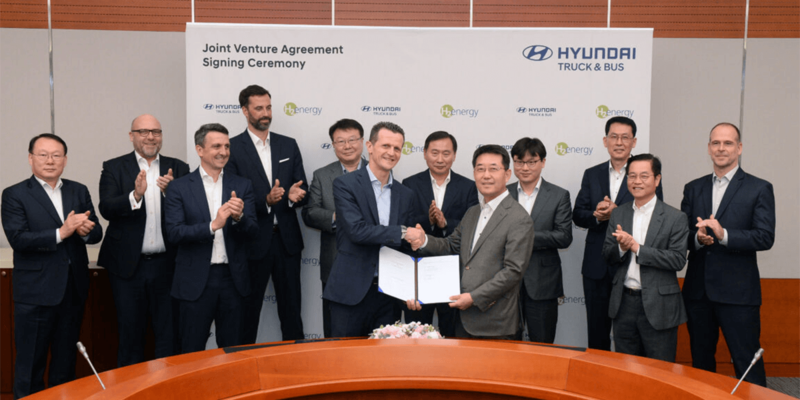 The new joint venture agreement states that Hyundai will supply a total of 1,600 fuel cell-powered heavy trucks to Hyundai Hydrogen Mobility from 2019 to 2025 – 600 more than originally announced in a memorandum of understanding signed in 2018 between H2E and Hyundai. 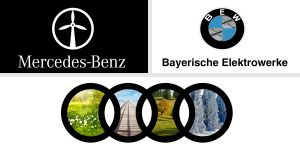 The Swiss company H2E specialises in the production and supply of renewable hydrogen in Switzerland with subsidiaries in Germany, Norway and Austria and they will be responsible for marketing the fleet. 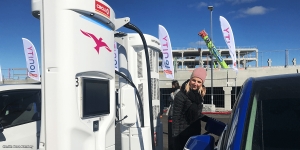 The joint venture, Hyundai Hydrogen Mobility intends to make the vehicles available to Swiss customers, first and foremost the members of the Swiss H2 Association, an organisation that unites several petrol station operators, retailers and other customers involved in this field. In Switzerland, a stringent road tax on diesel trucks is incentivizing fleet operators to switch to zero emission vehicles. The joint venture between Hyundai and H2E will then have the task of expanding its market presence in other European countries as quickly as possible. 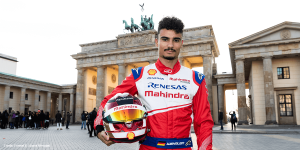 This is to take place via a sales subsidiary of the joint venture, which will initially produce and supply hydrogen in Switzerland but is already being established with the prospect of entering other European countries. “With today’s agreement, Hyundai Motor will strengthen its business operations across the hydrogen ecosystems in Switzerland and beyond,” said In Cheol Lee, Executive Vice President and Head of Commercial Vehicle Division at Hyundai Motor. The Swiss project will be a first step towards entering the larger European market with Hyundai Motor’s own fuel cell electric trucks. 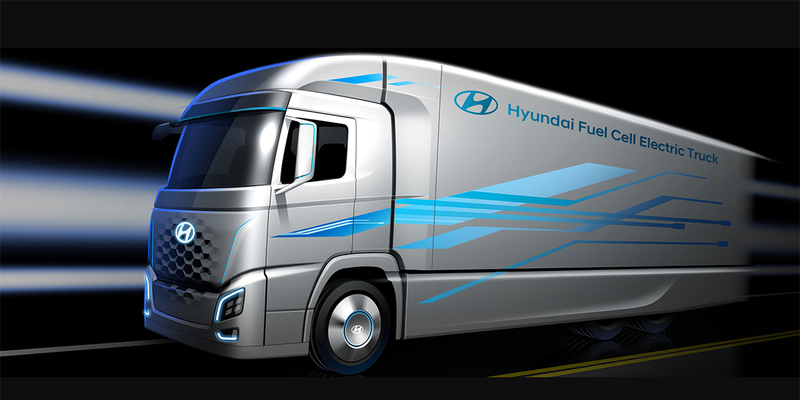 After scaling up to meet the demand in Europe, Hyundai then plans to launch its fuel cell commercial vehicle businesses in other regions around the world, including the U.S. and domestic market in Korea. Hyundai has already addressed the passenger car market with its two fuel cell cars ix35 Fuel Cell (2013) and Nexo (2017); in the meantime, the engineers of the South Korean manufacturer have also focused their attention on the design of a fuel cell truck. 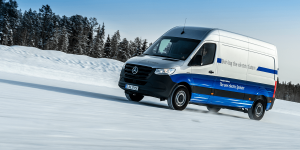 In September 2018, the carmaker in Hanover consequently put the Fuel Cell Electric Truck in the limelight. The model has eight integrated hydrogen tanks and a range of 400 kilometres. The 18-ton truck (with trailer: 34 t) can hold almost 33 kg H2 at 350 bar in its tanks and has an electric motor with 350 kW peak power and a maximum torque of 3,400 Nm. Hyundai Motor Group has been investing in the growth of fuel cell and other related industries globally as part of its FCEV Vision 2030. 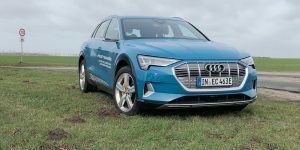 For this undertaking, it seems there is wider governmental and industry support in South Korea with an investment of around 2 billion euros into hydrogen mobility over the next five years.